The first half of October in 2011 was well blessed with sunny weather (unlike early September when I holidayed in Southenr England!). So, scrutinising the forecasts I spotted a good day and headed off by train to Rugby, a town long renowned for its rather ugly radio aerials blotting the landscape to the East. The Oxford runs in between the town and the aerials and close to a rail mainline, but also, luckily, alongside a splendidly picturesque golf course. The latter is well worth a mooring and view as you can see from my slideshow. I walked the 1/2 mile or so from the station to the Avon Aqueduct, then turned South along the towpath. The first view was impressive in contrasting areas of light though without any specific landmark. 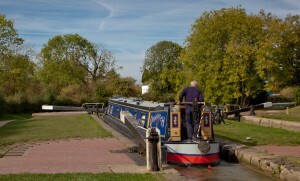 The canal was very rural and quiet, ideal for relaxed canal cruising. But I was eager to see the locks and spent little time photographing the route except for Clifton, an oasis of facilities. I was delighted by the sight of a lazy bull with large curled horns relaxing in a field on the opposite side of the canal from the towpath. 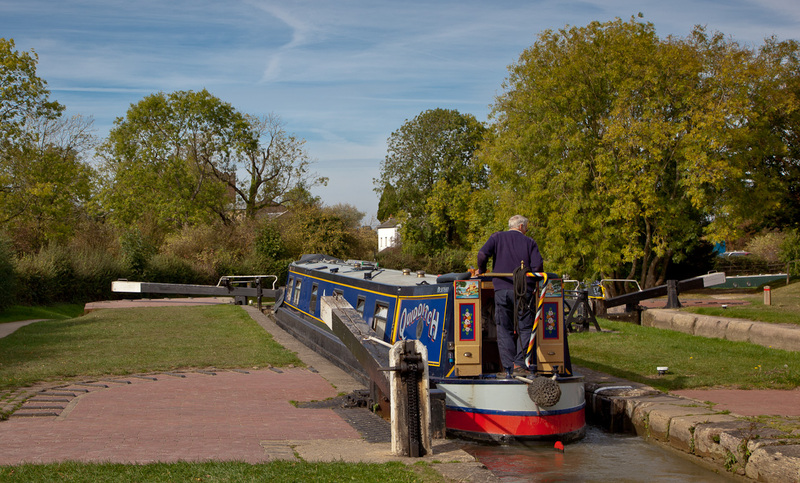 Then I arrived at the locks, meeting nb Piston Broke (yes!) and its owners whom I met earlier this year in Chester. I arrived at the locks announced by a BW notice board, and what a pleasant visual surprise they were. A set of three pairs of side by side locks, set in a sparsely populated village scene. There were plenty of boats to add life to the scenes and the weather was actually better than predicted by my forecasting website, in that the descent into gloomy cloud cover lasted no more than half an hour – nevertheless the cloud did not help some of the scenes I photographed. Through lack of water one lock of each pair was closed and surrounded by non photographic red tape which just shows how lacking in aesthetic appreciation some folk are both to the photographer like me and the customers boating through collecting images of their journey – BW just needs a discrete board to signal closure not yards of ugly red tape! Anyway, I managed to exclude this from my shots and here is a SLIDESHOW of my pedestrian navigation followed by a Google map of the area.